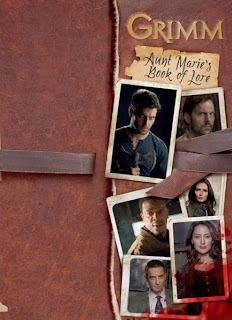 Review of Grimm - Aunt Marie's Book of Lore + a Giveaway! Okay Grimmsters, I've got something for you today that should get you pumped. Titan Books were nice enough to send me a review copy of their new book - Grimm - Aunt Marie's Book of Lore. A must-have for any true Grimm fan! Yeah, you know that book that Nick looks through occasionally when he has some Wesen he's never encountered before? This is basically a version of that, but in handy glossy-page form. The book explores some of the monsters, weapons and potions featured on the show, with detailed pictures and descriptions. I've got some sample pages below to give you an idea of a couple of them. Fitting the show's background, many of the entries are in other languages, with some translations "sticky-noted" on in English. Throughout the pages there are little bits of viscera and bugs to make it look like the book has been through the ringer. Most of the descriptions are accompanied by hand-drawn pictures as well as photos from the show itself. There are also some pages devoted specifically to weapons and potions for those who are in to that. I think my favorite thing was one page that had a hole "burned" in it, and you could see through to the next page, and it actually had stuff in the hole from the next page to make it seem like an actual hole. Cool detail. Some of your favorite Wesen get detailed, including the Blutbad and the Hexenbiest. Overall, it's a fun book that isn't your typical companion piece, but rather feels more like something coming direct from the world itself, which is always cool. You'll probably enjoy it if you're a fan of the show, and especially if you like the lore behind it all. The only thing I would say is that you kind of wish it was upholstered in actual leather, and that it's sometimes hard to read the pages because they are meant to look sort of realistic. I suppose maybe that would be a plus for some people, but I found myself kind of glossing over some things that looked too cramped and hard to read. Nonetheless, a fun book that will surely delight any Grimmster out there. I must admit, I have a special place in my viewing heart for this show, because it's filmed in Portland, my hometown. Most episodes I can see some place and go, I know that! I know where that is! And I get all excited and nostalgic and slightly homesick and wish I could somehow work on it up there. There are three ways for you to enter, which means three separate entries to win. So, the more of these things you do, the more likely your chance to win! 1. Leave a comment here on this post. Maybe say who your favorite character on the show is for fun. Or what your favorite episode has been. Whatever you want! 2. Like my page on Facebook and leave a comment on there that you're entering to win the book. 3. Follow me on Twitter and RT this tweet. The giveaway will close on Friday, November 29, at 11:59pm PST. Grimm and Blutbad are my favorite!!! Hi! Nick Burkhardt is my favorite character of the show. I love him as Grimm. But I also like Monroe and Captain Renard very much! I guess my favorite Wesen is a Blutbad, but I must always laugh about Bud as an Eisbiber. I would say, one of my favorite episodes so far is..that is really a very hard choice! One of them is "Kiss of the Muse". I am from Germany and really love the mix of German language in word and writing in the series.. next to the other languages like French! Kind regards! Monroe has been my favorite from the start. He's charming without even trying. His love for Halloween rivals my own love for the holiday. I've often been told that I'm a lot like him, so I guess that's another reason to like him. Plus, he's a total gentleman. The book looks awesome. I'm a huge Grimm fan. Hank is my favorite. He hasn't freaked out over all the crazy wesen stuff. In fact, he thinks it's all pretty cool. Thanks for the giveaway!